Terezayi District Sub-Governor Amir Bhad Shah was literally waiting out in the middle of the road as our convoy arrived, a dangerous position for a Governor to place himself in. If you were to tell me three months ago that I'd soon be delivering 400 tree saplings to a village, twice a week; I'd probably look at you as if you had a third eyeball growing in the center of your forehead. Of all my coursework during college, my botany or horticulture professors were not the first I requested letters of recommendation from. For that matter, no member of our entire 60+ person team has any significant experience in the forestry industry. After conducting several visits and needs assessments throughout the province, it was evident that we were going to have to involve ourselves in the forestry business. 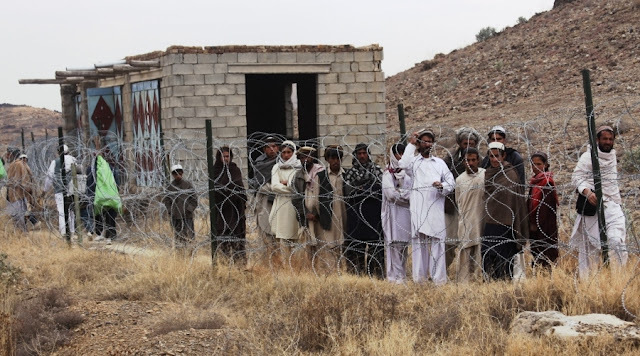 Enter our friends from the Afghan Water Agriculture and Technology Transfer (AWATT) project- in a previous post (Operation Check Dam) I detail an encounter with Dr. John Groninger. John has since returned to campus life in Southern Illinois, but through continued contact with John I was introduced to another John. Dr. John Harrington is another forestry professor, also with AWATT, who hails from the great state of New Mexico and appropriately enough specializes in arid climates. After several weeks of coordination over email, John was finally able to escape the hustle and bustle of Kabul and sneak down to spend a few days with us at FOB Salerno. With the help of the experts at AWATT and the ability to tackle an initiative as a team, the 3-19th ADT might just become the Bad News Bears of the forestry industry. 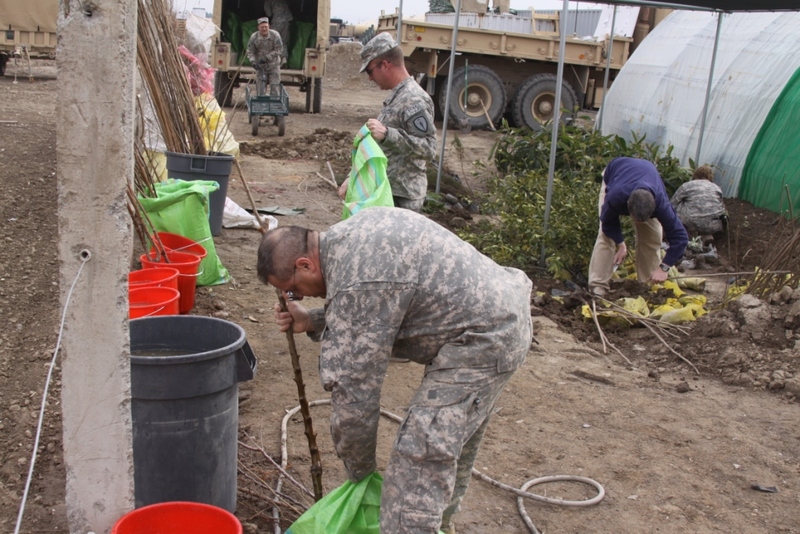 A look at the makeshift nursery set up on the 3-19th ADT's demonstration farm on FOB Salerno. The forestry initiative is a team project, usually requiring 5-7 team members to complete a mission set. While we had the luxury of hosting an in-house forester, we decided it would be best to put his skills to use in a district that could really use some help. Nearly six weeks ago, members of the 3-19th ADT first traveled to the Terezayi District in an effort to assess the needs of the villagers. During this meeting, the number one need presented was once again tree saplings. Immediately following this meeting, the district ag extension agent was kind enough to show us around the district center. 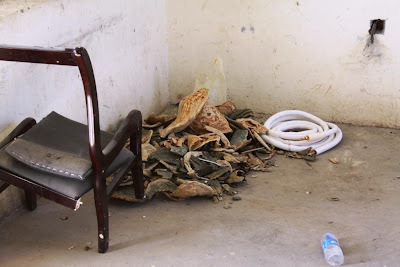 The first room we stopped in was a barren, concrete room with literally nothing inside of it besides a broken chair, some moldy flatbread, and a coiled up hose- all crammed into one corner. 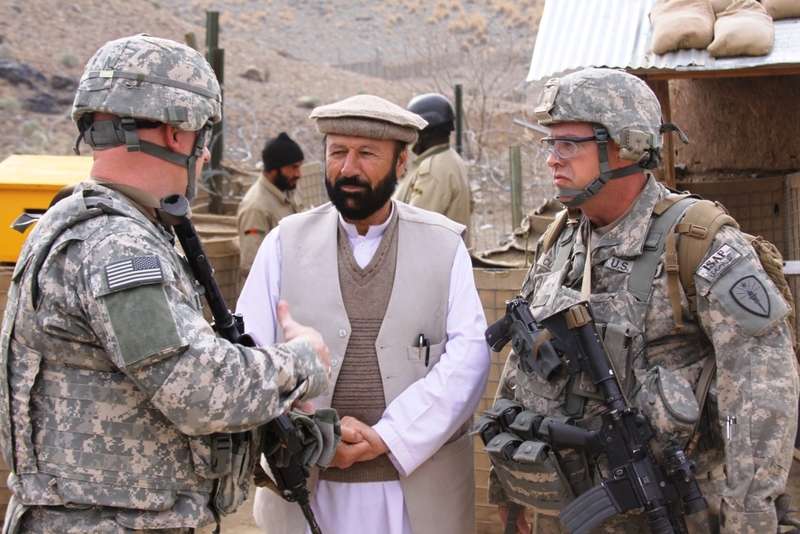 Haji Mohammad, the ag extension agent, assured me this mess could be cleaned up in no time and that his district would be prepared to conduct a training seminar on a moment's notice. It'd be safe to say that I was more than a little hesitant to set off to a district such as Terezayi on our one mission with Dr. Harrington, but I'm happy to report Haji Mohammad is a man of his word. Not only did he have the room cleaned since our last visit, he also had it filled with chairs and even a desk for instruction. (Note the machine gun spray of bullet holes all across the back wall of the picture below, this continued around the entire perimeter of the room- unfortunately these holes were still in tact, a grave reminder of the tragedy that even this very room has hosted through the years.) 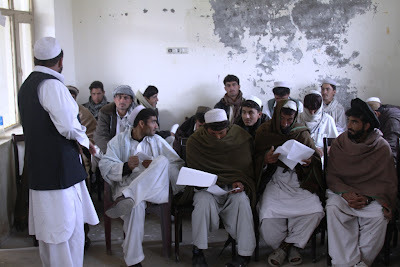 Most importantly, every chair in the room (20 of them) was filled with a young Afghan farmer, each eager for instruction. 20 Terezayi farmers patiently await their block of forestry instruction. Following a brief introduction of all those in the room by the Terezayi District Sub-Governor, the ag extension agent began to give the lesson on forestry he had prepared. 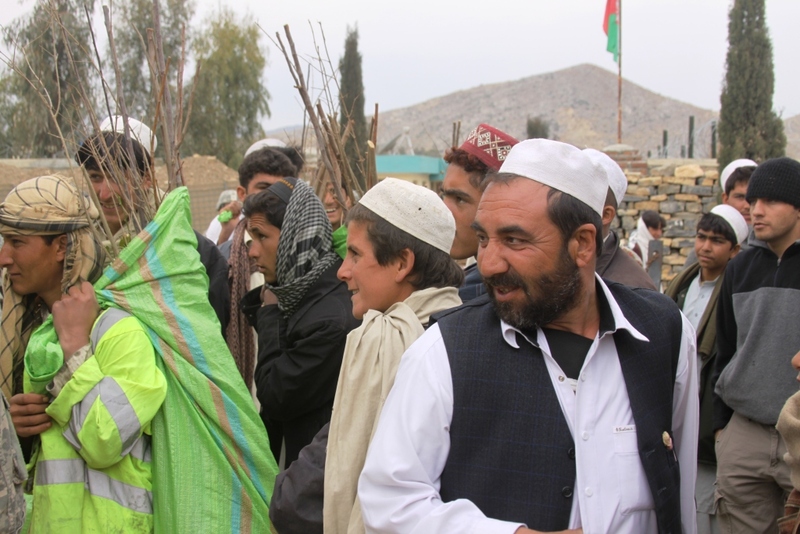 After about 30 minutes of instruction, Haji Mohammad offered Dr. Harrington an opportunity to address the farmers. John was very cordial in his remarks, paying close attention to ensure he only reinforced points already covered by Haji Mohammad in an effort to boost credibility of the district ag extension agent. 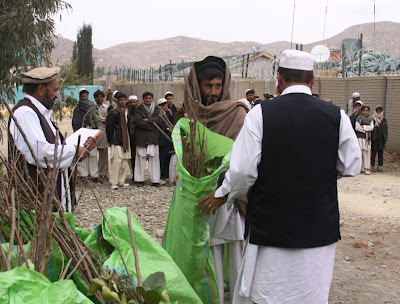 Haji Mohammad was responsible for issuing each attendee their bag full of 20 tree saplings. In an effort to appear as nothing more than the enablers, we in camouflage did our best to stay out of sight as it came time for dissemination of the sapling bags. Each bag consisted of 20 trees, thus tallying up as quite a valuable bundle for the men to carry home. Haji Mohammad conducted the official issuing of the trees to each attendee of the training session, while the others waited patiently for their turn to collect. Well I'm no Paul Harvey, but what more could you ask for during a radio debut? 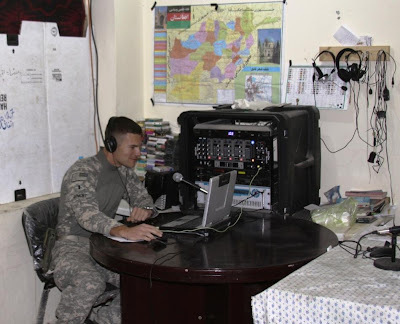 The east wing of the Terezayi District Center is home to Khowst Radio. Because of it's relative inexpensiveness, radio is the number one source of news and information for the people of the Khowst Province. While touring the radio station, I was shocked to find a few cots and beds lining the walls of the station. Apparently the DJ's sleep in the studio on most evenings. After ensuring the tree delivery had gone smoothly, I couldn't resist jumping on the airwaves in an effort to try out some of my Pashto. Robin Williams would have been proud at the clarity in my "Good morning Afghanistan!" Villagers look inquisitively into the Terezayi District Center as forestry training attendees are issued their take-home bags. As we prepared to leave the Terezayi District, the sight outside the gate was yet another solemn reminder of the many individuals we weren't able to provide training to during our visit. While Haji Mohammad had been issuing the bags filled with tree saplings, dozens of villagers lined the constantina wire outside the District Center, just trying to catch a peak of what their fellow tribesmen were carrying home. While it often seems we face an uphill battle here in the work we are trying to accomplish, together as a team (AWATT folks included) we are making some marked progress. Members of the 3-19th ADT will continue to work together, one district and 20 trees at a time, to provide the people of the Khowst Province with a sustainable way of life for generations to come.